Our Lady At Work In Albuquerque: Feast of Our Lady of Perpetual Help! MAKE HER KNOWN – With those words, Pope Pius IX entrusted the icon of Our Mother of Perpetual Help to the care of the Redemptorist Order on this day in 1866. On that first day, as the icon was carried through Rome’s streets in procession, miracles took place, and miracles continue to this day as God answers prayers which the Virgin Mary, the Theotokos (Mother of God) intercedes for under this title. As an icon given to a Latin Rite Order, this beautiful image of Mary and Jesus has served as a bridge to the East. The Redemptorists founded Eastern branches in the Ukrainian Greek Catholic Church in 1913 at L’viv, and in 1921 in eastern Slovakia at Michalovce, which serves the Byzantine-Ruthenian Catholic Church, to which I belong. In 1934, Pope Pius XI gave the Sisters of St. Basil the Great – Uniontown Province – a copy of this icon to promote pilgrimages for peace in the Church at a time when our Church in America was being torn by schism. These pilgrimages at Uniontown broughts tens of thousands of people on Labor Day weekend for The Otpust, the biggest Byzantine Catholic gathering in America. This continues today: the traditional litany of “O Mary help us, O Mary help us” has been repeated by so many people, and you can do the same at our parish on Wednesday nights. Since a majority came from Ruthenian parishes back East, the people wrote to Bishop Emil Mihalik of Parma, who had jurisdiction over the Western States for the Byzantine Catholic Metropolia to get their own priest, and to establish a parish named Our Lady of Perpetual Help, as Mary was definitely helping them move so quickly. While he agreed to work with them for a priest, he declined the name, writing that there were too many churches with that name. The laity persevered, and purchased a church with a residence and parking lot on Bell SE, in what now has the rather elaborate title International District, generally known as Trumbull. Bishop Mihalik sent Father John Kovach as the first pastor, and yielded to both the pressures of the faithful and the intercession of Mary, and the parish was given this glorious name, Our Lady of Perpetual Help and canonically established us in November, 1974 http://www.olphnm.org/ . My first Divine Liturgy here was the feast of St. Elijah the Prophet on July 20, 1985. 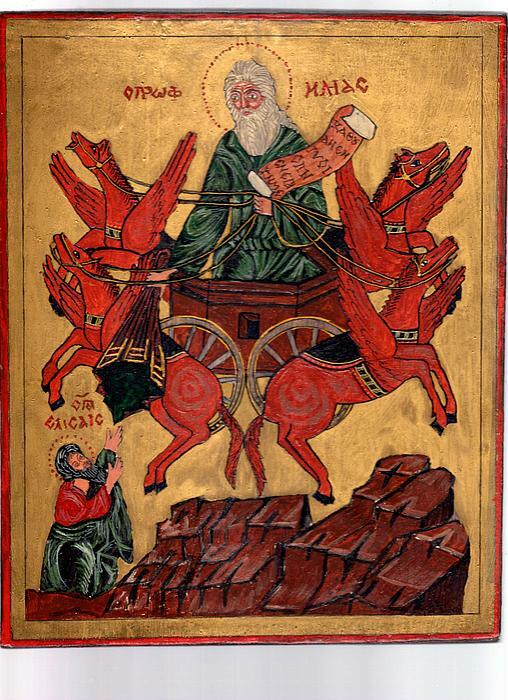 I blessed cars after the Liturgy, as Elijah is the patron of vehicles (due to his ascent to heaven in a fiery chariot!) and we were off! Bishop Thomas Dolinay told me to come here for a couple of years, and then he’d send me on to another church. But that never happened. The Perpetual Help icon has been the site of many prayers over the years, and many favors granted by God. Every Wednesday night, devout members of the parish gather at 5:30 PM to pray the traditional prayers and litany, and sing the popular Byzantine hymns in honor of Our Lady. Mary has blessed us in many ways, and under different titles, as you’ll see below! One of the ladies in the parish always said that something wonderful would happen here. She was hoping for a miracle like the weeping icon of Mariapocs. We did not get that, but we have had many, many other blessings. Our pastor, Fr. Artur Bubnevych, carries the large Helper of Mothers icon in the March for Life, 2016. Our Lady, Helper of Mothers – The original small icon came to our parish in 1997, and has been accompanied by miracles ever since: difficult pregnancies or childbirths ending safely; couples who had used all possible Church-approved methods of conception and still being childless, conceiving successfully. 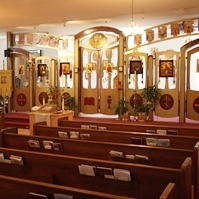 The large gold-covered icon was purchased by then-Father Kurt Burnette, and has been successfully presented at abortion clinics and resulting in some turnarounds and thus babies saved, or going to parishes and thus more couples finding out about this icon and the blessings accompanying it. Our parish continues today – this year we had the biggest parish bazaar ever; half our membership is under 18 years of age; adult education, Knights of Columbus, choir, OLPHelpers for the women, Eastern Christian Formation for children, weekly prayers at the abortion clinic, weekly prayers to Our Lady of Perpetual Help in church – it stands as a witness to Jesus Christ the High Priest, to our Catholic Faith expressed fully in the Byzantine Tradition, as a family of worshippers committed to living out the Faith as well as possible, and looking forward to the future. Come by sometime – it’s a great church, and that lady was right – great things are happening here. « We admitted 1037 Syrian refugees to the US last month: how many Christians?